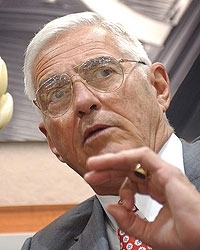 DETROIT -- General Motors Vice Chairman Bob Lutz envisions the Obama administrations automotive task force evolving into a permanent entity exercising benevolent oversight of the industry. Lutz, who remains a strategic advisor to GM until year end, said the task force has fostered valuable discussion of trade and automotive regulations. I fully expect and I hope that it will be replaced with some sort of permanent structure that facilitates the continuation of this dialogue, Lutz said in a speech here today to the Automotive Press Association. Lutz said U.S. automakers have never had the same level of government support enjoyed by automakers in most other nations. He cited MITI, the Japanese governments Ministry of International Trade and Industry, as an example. The Obama administration has shown willingness to work with the industry on fuel economy regulations, trade rules and currency issues, which Lutz said have given an advantage to Asian automakers. Lutz said GM will be well-positioned to benefit from a recovery in auto sales, whether it restructures in or outside of bankruptcy. By shedding legacy costs such as retiree health care, it will have both a more competitive cost structure and more resources for product development, he said. A bankruptcy filing would have a short-term negative effect on sales and most likely would give competing brands a temporary boost, he added. Frankly, I hate to say it, but I think the impact on competitors short term is going to be positive, he said. Lutz said auto sales will bounce back. GM forecasts U.S. sales of 10.5 million this year, rising to 12.5 million next year. But, Lutz said, he doubts that sales will return to the 17 million-unit level of earlier this decade because consumers will emerge from the recession with conservative spending habits. Sales will probably stay in the range of 12.5 million to 14.5 million units, he said.